How might one live the Christian faith within a culture that idealizes and privileges Christianity while also relativizing it, rendering it redundant and innocuous? Arguing for a reconceptualization of the theology of the cross and radical communal practices, this book brings together two clusters of critics of Christian acculturation and accommodation: (1) Lutherans such as Kierkegaard and Bonhoeffer who lift up radical discipleship against the propensity toward "cheap grace," and (2) various "Anti-Constantinians," including nee-monastic communities, who resists the church's collusion with power politics, symbolized by the conversion of Constantine in the early fourth century. 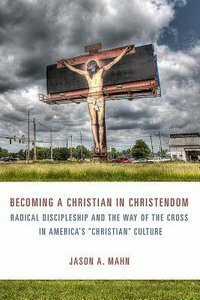 Mahn provocatively imagines alternatives to conventional Christianity - ones whereby the church embodies an alternative politic, where it commits to cruciform non-violence, appreciates gifts by giving them away, and knows its boundaries well enough to learn from those on the other side. About "Becoming a Christian in Christendom"